Natasya has been alive for almost 500 years. She's one of the Immortals, nearly impossible to kill and fated to live forever. She has spent the past century in the company of her best friend Inocencio, seeking the next best party or thrill. But when Inocencio thoughtlessly tortures a human, Natasya is jolted from her meaningless lifestyle. Panicked, she runs away and seeks refuge with River, an Immortal she met years earlier, who offers a home for wayward Immortals. Though she is opposed to River's rules and ideals at first, the longer she immerses herself into a simple existence, the more she realizes what's been missing in her long life—including clues to her troubled past. Immortal Beloved is a surprisingly engrossing novel. Natasya has a very cynical voice, but as Tiernan gets further along in the story, layers of sarcasm are peeled back to reveal a very real girl who has been unhappy for decades, a direct result of attempting to grapple with a dark past she doesn't fully understand. Tiernan does a good job at making a character that has been around for centuries still sound like a relatable, sometimes immature teenager, and cites the reasons for Natasya's behavior as emotional pain and uncertainty. There is a certain amount of romanticism to the setting of River's home and the rural life that helps so many Immortals connect with each other and the lighter sides of their potential power. 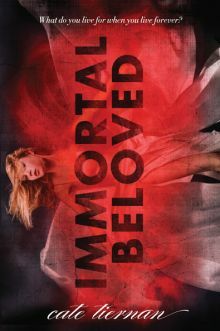 However, Immortal Beloved does stay rooted in more human instincts and actions with some drama between Natasya, the mysterious and handsome Reyn, and the younger Immortal Nell who has a hopeless crush on Reyn and sees Natasya as a threat. The tensions between Natasya and Reyn, who hovers on the edges of her long memory, are interesting, and their physical interactions electric, which will satisfy readers with just enough romance without losing focus on Natasya's emotional journey. Though the ending is anti-climatic, readers will be very proud with how far their heroine has come, and interested in what her significance is in the world of the Immortals and how it will play out in book two, Darkness Falls. Cover Comments: Though it is probably a little more commercial than my tastes usually run, I do like this cover. The font, the red smoke, and the sideways picture of the girl all create a very eye-catching image.